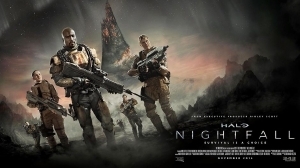 Halo: Nightfall (review) is available on home video today but we were lucky enough to get our hands on a couple of blu-rays to give away to our readers! We dropped all of the names into a random name selector, pressed the magic button and tada! Out came our two names! Congratulations to Ron Oliver and William Griesmer on your win! Weâ€™ll be getting in touch via e-mail in the next day or two to arrange for shipping. For those that didnâ€™t win, donâ€™t worry, weâ€™ll have some more awesome prizes in the coming weeks plus, you can pick-up your own copy of Halo: Nightfall right now!